England batsman Mooen Ali has admitted mental problems caused his struggles against the short ball. Moeen, 27, said he has been "working hard in the nets" after displaying weakness when targeted with bouncers by India in last summer's Test series. He is expected to open the batting in Friday's 50-over tri-series opener against Australia in Sydney, with the World Cup starting next month. 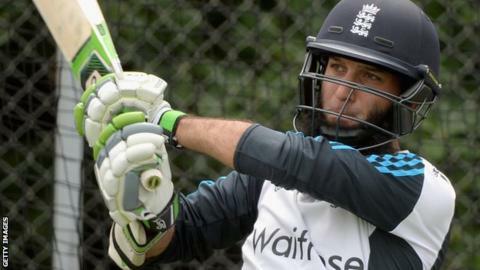 "Mentally, I was probably in the wrong place batting-wise," he told BBC Sport. "I feel like I'm over that, I feel like I'm ready. I've never had a problem before - I think it was just a little blip against India." Mooen appeared to have put his technical issues behind him when making the third-fastest one-day hundred by an England batsman against Sri Lanka in November. The Worcestershire player says he learned to be more selective when attacking the short ball during the ODI series in Sri Lanka. "The one thing I learned from there was I was probably batting for everyone else rather than myself," he added. "I was trying to show I could be really aggressive at times. Most of the time you can't be like that. "Maybe it'll come off here. You've got to be aggressive but also be smart and I feel like I'm getting better at that." Mooen made 50 and took two wickets as England beat an Australian Capital Territory XI by 216 runs in Canberra on Monday. They face a Prime Minister's XI at the same venue on Wednesday, before the tri-series, which also features India, gets under way. England's first World Cup match is against Australia in Melbourne on 14 February.